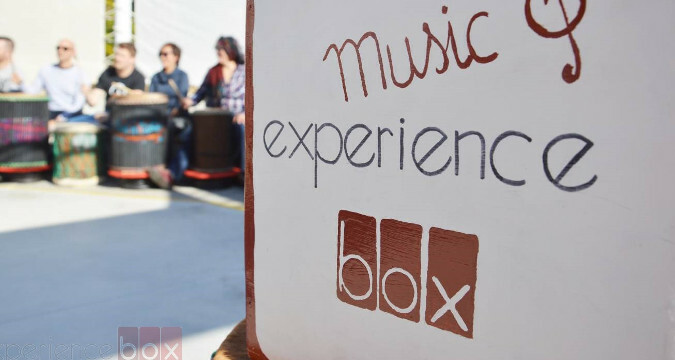 Experience Box brings you this ultimate, unique and powerful group activity: an unforgettable "Drumming Session" to take place in your conference room or any other space that would suit your needs (gardfen, beach, patio...). This is generally a 30-minute energizing experience, perfect for corporate groups of any size, as it develops "unity", cohesion, team work, concentration and a lot of fun. We will gather the entire group in one single space and learn the basics of drumming, with the objective to finish the session playing all together "in unison". 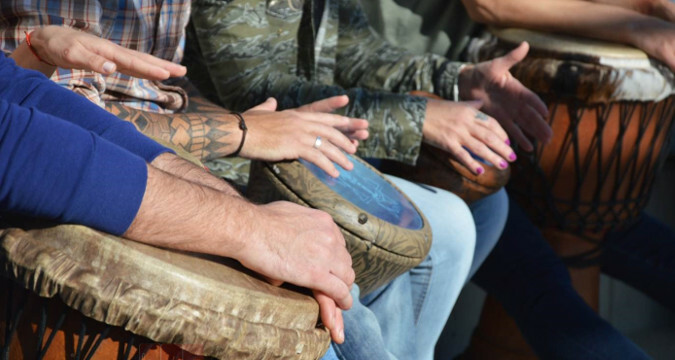 For our Interactive Drumming Event, each person will be given a type of drum to play. When the group realizes that they will be playing these instruments, the excitement can be felt immediately. We start everyone off playing a simple base beat which synchronizes all the efforts of the audience and becomes the 'pulse', the 'heartbeat' of the room. We then build on, teaching to the different sections of the group the different rhythms and beats to play (which can represent different teams, departments, etc) and then get the entire group to work together in a unified way, transforming your audience into a magical dramatic orchestra. We set the pace and increase the momentum throughout the session (which adds to the anticipation and excitement) into a grand finale at the end which is sure to leave everyone astounded at what they can achieve together as a collective whole. We guaranteed to deliver a WOW factor while they will get to create their very unique and magical experience, mostly on their own - which often becomes an unforgettable moment of collaboration for the group. This Interactive Sessions show people the power of groups, that we are all one, and the unity that comes from collaboration. 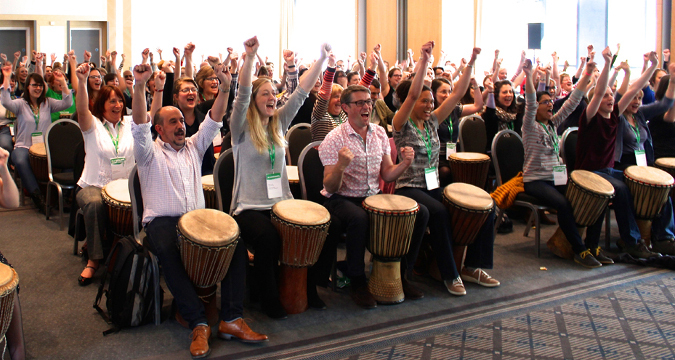 For thousands of years, people have created music in unison to show group spirit...and this group spirit leaves participants feeling connected, and exhilarated as well as with the wonderful memory of taking part in something unique and interesting. Everybody gets back more energy than they put in. This is almost a mystery and is the central concept of all kinds of group energy. A crowd of people has the power to lift itself up, sometimes even into a frenzy, and if a team can harness this power, it can inspire everybody, encourage even more energy and leaves everyone feeling unified, energized and with a common purpose. Just Imagine the power of the entire group....making music together! 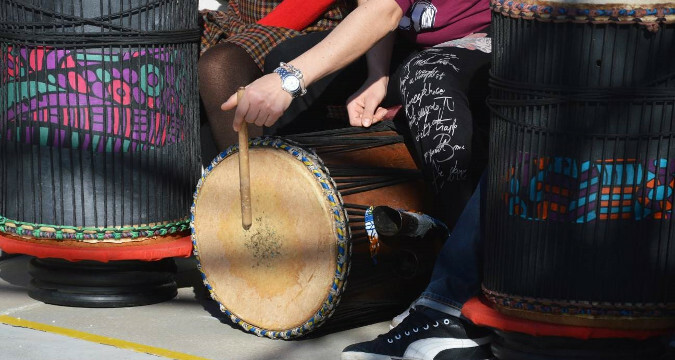 This is a similar activity combining different sorts of percussion instruments (congas, surdos, repeniques, socalios, agogos, darbouka, drums, etc). They will be guided at all time by our professional expert musicians, who will handle the teaching part based on the basics of drumming musicality, starting with a basic pulse and ending with a wonderfull grand finale. This experience will for sure develop the team work skills, communication, listening, concentration as well as many other interpersonal skills, all this to create a unique atmosphere that will surely not be forgotten. This is a very original icebreaking or even a teambuilding activity for groups looking to learn and experience a creative activity that combines teamwork, music, fun and colaboration.